As a San Francisco native, I could probably write 100 posts on San Francisco, but this is a good start if you’re not sure where to go for a weekend trip! Take full advantage of SF’s iconic views at the Intercontinental Hotel in downtown San Francisco! How impressive are these huge windows which highlight the city skyline? I also love any window seat that has enough room for me to sit and read or just gaze out at the views. 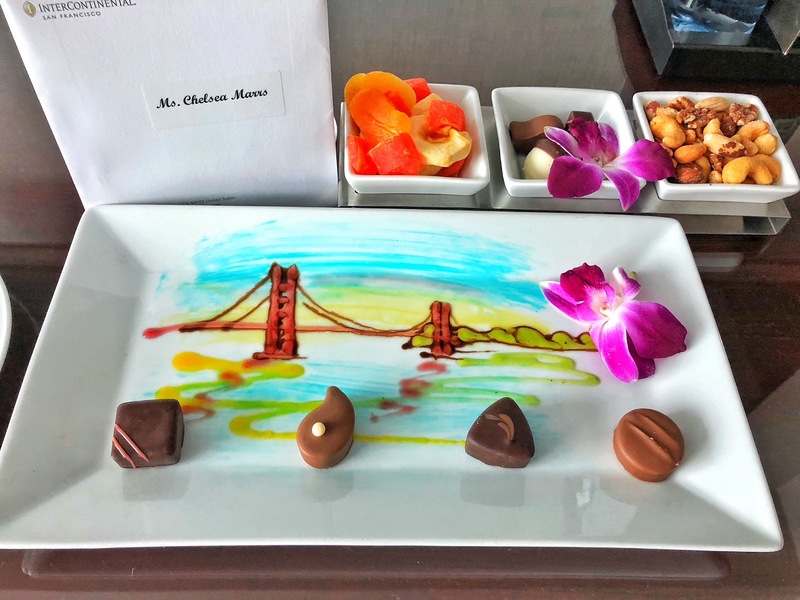 The staff was super accommodating and put out such a gorgeous chocolate welcome with the Golden Gate Bridge as backdrop! 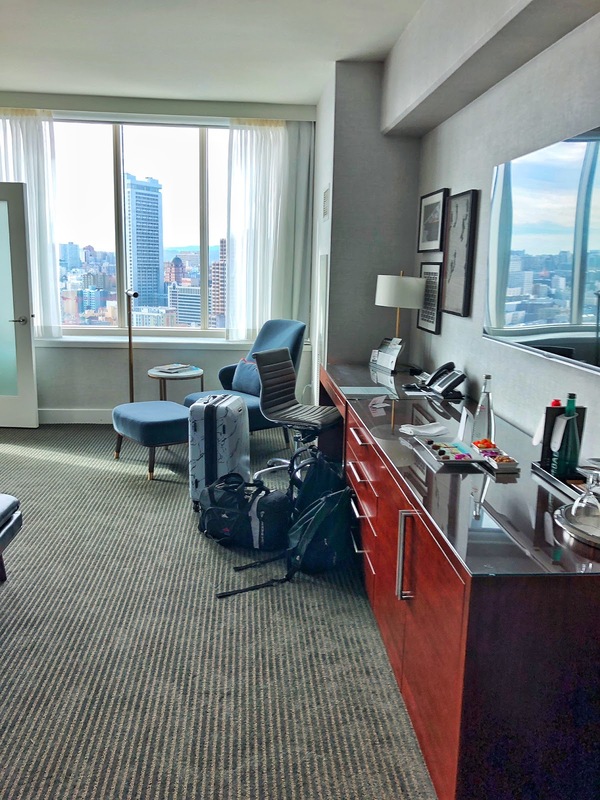 One of my favorite aspects of the Intercontinental is that it’s conveniently located right around the corner from the Westfield Mall, Target, and the AMC movie theater, not to mention just a 5 minute walk to Union Square and the cable cars. This proved helpful in getting last-minute wedding items, and is perfect for out-of-town visitors to see the sights and get a little shopping in! Fun fact: The blinds to these epic windows were controlled by a button by the front door which felt very luxurious. What a cozy spot for some light reading (and let’s be real – probably dozing in this comfy chair)! Loved their spotless marble bathroom, which also had breathtaking views (including the stunning city hall) and a large window seat. If this looks familiar it’s because I came here for dinner at the Michelin-starred restaurant Luce a few years back! High ceilings and modern interiors make even the restaurant and lobby super swanky. Want to try something different? Come to Aina for Hawaiian dishes like loco moco and these custard-filled donuts! Fun fact for those who don’t know: Polynesian culture is big for me since I used to dance Tahitian and Hula back in the day. I even got to perform at a 49ers halftime show for it! But back to the food here – it’s amazing and the atmosphere is rustic and comfy. Plow is known for no muss, no fuss breakfast and brunch. They’re not reinventing the wheel here, but their simple & fresh ingredients speak for themselves. They even have warm blankets out on the patio to keep you cozy on those foggy days. Pier 23 is the place to go on sunny days in the city! Here you’ll find great views of the bay & boats sailing by. You may even spot a sea lion or two if you look closely! I’ve been going to International Cafe in the Lower Haight since I was a baby. This local gem has comfy couches, an outdoor patio, and live music all the time. My favorite is their tuna on dutch crunch! Uva Enoteca is one of my favorite local spots. My dad and I go here for dinner a lot when I visit home! They have incredible pastas and must-try desserts. Sunny days call for city views in Dolores Park, which is just a short walk from my house luckily! This section of the park is called the beach because the wind going through the palm trees sounds just like waves crashing on the shore. The funny thing is that it’s often warmer than our ACTUAL beach (Ocean Beach), because of SF’s micro climates. Of course not every day can be so sunny. Even on days with Karl the Fog (yes the fog even has a name here), the views are epic though. There are some fun secret swing spots in the city atop a few of the many hills! The Ramp is a great local restaurant/bar with views of the bay and fun ships. Take a stroll around the Mission / Valencia / Haight Street for some really impressive street art. The Bay Bridge is always a sight for sore eyes. The Ferry Building can be touristy, but is a great area to stroll and people watch. Weekends are best spent in a park, like this one in Fort Mason. Can you spot the Golden Gate Bridge? Union Square is great for retail therapy if that’s what you’re after. For more SF posts see my local’s guide and fashion post! Have you been to SF? What’s your favorite spot here?